Snap, Crackle, Pop! Jeremy, Aaron, Keith and Andrew dive into a bowl of Kellogg's Rice Krispies and discuss the origins of the cereal and its mascots. Know around the world as Nestle Golden Grahams, this cereal is "Crammed with Graham" cracker flavor. It's the most unhealthy cereal there is: Honey Smacks; and Jeremy, Aaron, Keith and Andrew attempt to consume an entire bowl. One of the many previous mascots. It's just chocolate flavored Kix. Did we blow your mind? Listen in to learn more about Cocoa Puffs. This time we delve into the most popular cereal there is, Honey Nut Cheerios. Colorful marshmallow bits and cereal, how can you go wrong? General Mill's Lucky Charms has a storied history of being the first cereal to incorporate "mar-bits". The idea came when the creator mixed Brach's circus peanuts with plain cereal. Some facts you may not know: only one marshmallow charm has survived the ages and Lucky wasn't always the mascot, Waldo the Wizard took over briefly in the seventies. Post's Fruity Pebbles, the famously fruit-flavored rice cereal is the oldest cereal based on a television character. For our tenth episode we invented a special event called the Raisin Bran Off. The name Raisin Bran cannot be trademarked and thus there have been over 300 different brands of Raisin Bran. We taste the top three, or at least the two most popular and a bag cereal version. Kellogg's Special K Original flavor is on the docket this time as it is Aaron's favorite flake. Original is just one of a truckload of flavors that Special K comes packaged in. We also welcome special guest Zak Dyer, friend of THE OMNICAST. It's a double length episode of CEREAL where we try two of the four different flavors of Quaker Oatmeal Squares back to back. First off is the classic Brown Sugar staple and then we try the new Honey Nut to see how it compares. Also, learn a lot about the company behind Oatmeal Squares. Like did you know Quaker used to give away parcels of land in their cereal boxes or that without Quaker the original movie Willie Wonka and the Chocolate Factory would never have been made. The crew is pleasantly surprised by Kellogg's long standing multicolored fruit flavored cereal. From the not-too-sweet taste to the fantastic back of the box, we all quite enjoyed this cereal for a change. So follow your nose to the cereal Toucan Sam is know for completely miss spelling. Now it's time for a mature, straight laced cereal that's great for soccer moms and their precocious toddlers. Multi Grain Cheerios is the health conscious branch of the Cheerios family and has been quite popular since its relaunch in 2009. Founded on the principal of using 5 whole grains (corn, wheat, oats, barley, and rice), General Mills has stressed that Multi Grain Cheerios will help you loose weight and lower your cholesterol. We welcome special guest James Leatherbarrow, Aaron's borther, to the show to talk about Cinnamon Toast Crunch a cereal that has been around some 65 years. CTC didn't come to the U.S. though until 1984. However, when it did Wendel, Bob and Quello made a big splash. 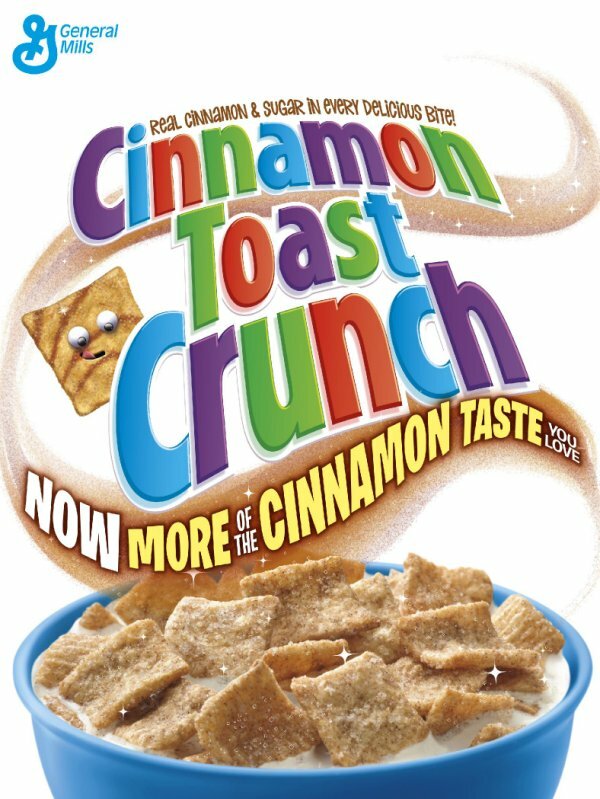 The slogan was originally "I'm feelin' Cinnamon Toast Cunch" later when the cereal changed it's image they said it was "The Taste You Can See", but now a days they go by "Crave Those Crazy Squares" refering to the new mascots Crunch and Slurp. For the fourth bowl of cereal Jeremy decided to feature General Mills latest comeback cereal from 1995, French Toast Crunch. It's the taste you can see shaped like tiny slices of toast flavored with maple syrup. It's the third bowl of CEREAL and this time we take a bite into Cap'n Crunch's Crunch Berries from Quaker Oats. Introduced in 1967 as the first variant of the original Cap'n Crunch circa 1963. Todays Crunch Berries come in four colors red, green, blue and violet but originally red was the only color until the 1990's. Next up is Kellogg's Crispix. For our inaugural episode Aaron has chosen Kix as the cereal for discussion. Kix was introduced as General Mills' second band of cereal in 1937. Their slogan "Kid tested, mother approved" has never been changed. This American lifestyle podcast will feature one brand of cereal every episode thoroughly discussed and evaluated on it's merits.